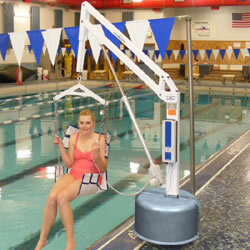 Sling seat option for the Revolution Pool Lift, sling and hanger bar included. A sling seating option for the Revolution Lift was designed to allow users to easily transfer patrons directly from their wheelchair to the pool using our durable mesh super duty sling. This comfortable mesh sling is made of anti-fungal polyester, mildew resistant and machine washable. The mesh sling has a higher weight capacity due to its thick polyester mesh layers. Double layers throughout the sling with double reinforced edging and a third layer along the middle of the sling to provide extra support. Rated for patient lifting devices, the sling has a lifting capacity of 500 lbs.